If it isn't known yet, I went on a trip to Japan in August (right smack in the typhoon period) and despite coming back with my usual haul of anime items, I also visited a ton of interesting places such as parks and museums. I do have plans on reviewing the latter sometime soon because of the huge impact each museum left on me. However, I decided that the most interesting and efficient way to comment about what I experienced in Japan this time is to start with my spoils. Unlike my previous trip, this one is much more print-orientated -- which means that I bought a ton more books than figures... and I figured, why not start with Shirobako? Shirobako is one of my favorite series in animeverse thus far and this book is quite different from what I am used to (official visual artbook) to something more fan-based (collection of art from fan artist). Perhaps it is due to the announcement of 1/8 Alter scale of Miyamori Aoi that rekindled my love for this series and resulted in me purchasing this book! 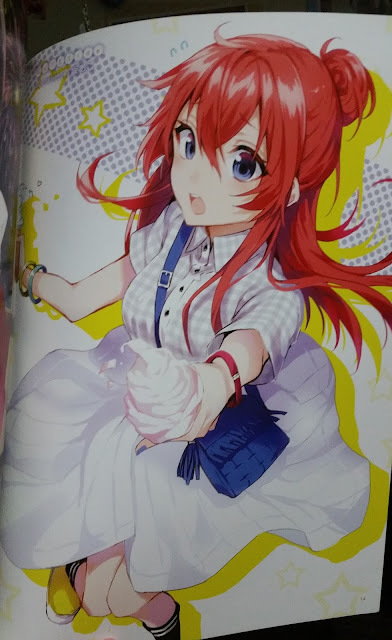 I would like to think that the book is not 100% doujin as I see a few insert art that resembles the official art to an uncanny extent. One such example is the cover of the book itself. 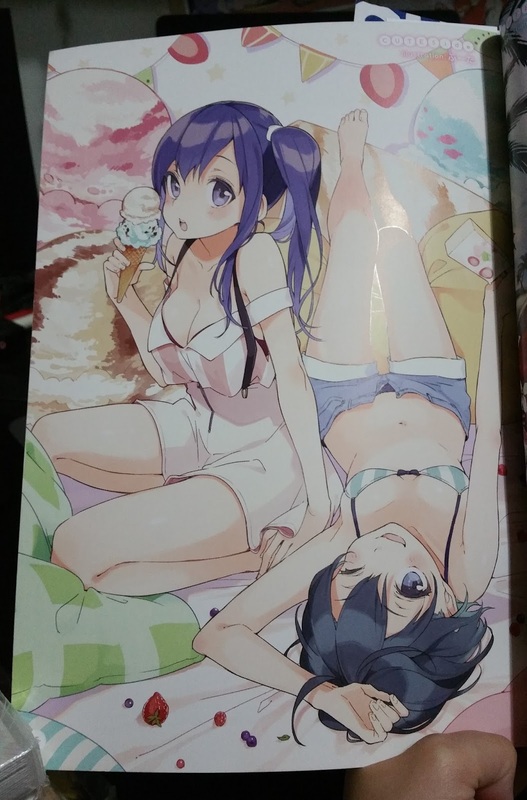 But of course, the first page into the book, we are reminded once again that this isn't the type of artbook I am usually used to. 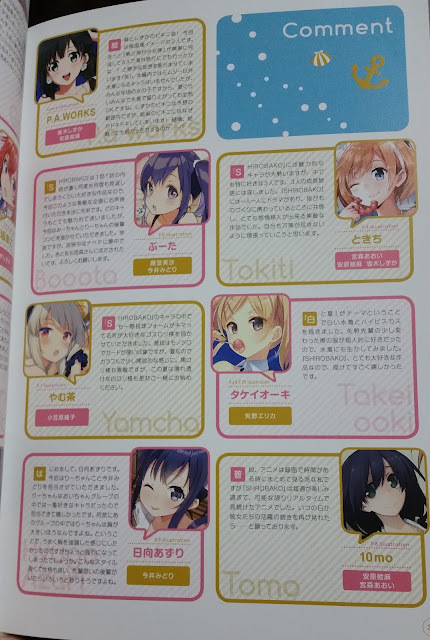 We see the numerous number of fan artists listed out on this page. If you see any artist's name you recognize here, good for you! As usual, I would not be taking a photo of every page as that is not the aim of this review. I would be taking a few shots of the fanart I personally find better and hopefully that can help you gauge your level of desire for this book! Of course, the main part of the book showcases our five little cute main characters and I particularly love the art-styles in the above two images. The featured characters have this cutesy yet elegant and mature edge to them. I would also like to point out the crisp line art and how the shading is spot on and creates the perfect illusion of depth. In addition, the book also ends with a short comic where you get to see out cute heroines (once again) in yukata, a type of summer kimono. 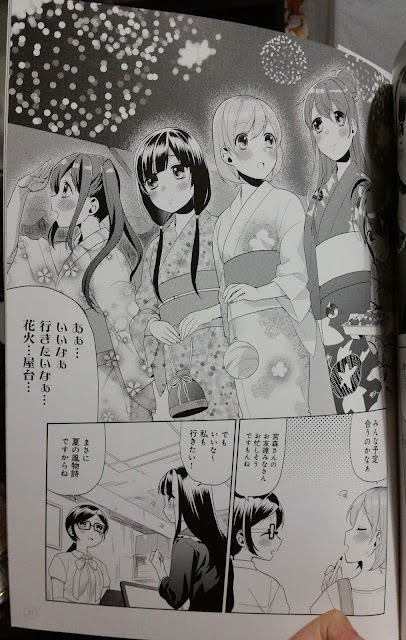 This ties in perfectly with the current season in Japan and I hope the five of them are enjoying themselves at a summer festival! 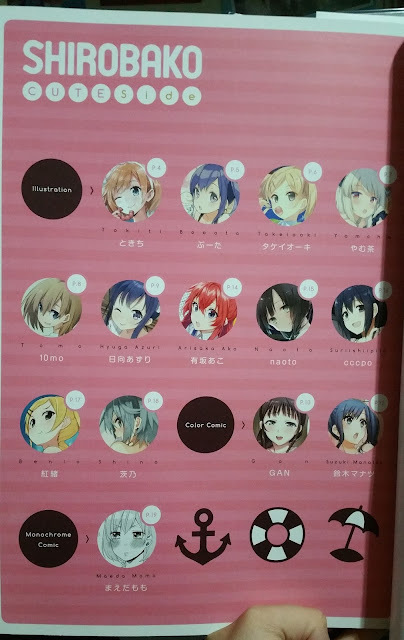 And as all books featuring mainly female characters, we have some explicitly fan-service pages such as this content page at the end of the book which focuses on the chests of the girls. Note that these are actual illustrations included in the book and if you like any of them (as weird as that sounds), you can check out the corresponding illustration at the mentioned pages. Some of the "better appreciated" art pieces, if I may call them that, are also featured after the content page to give the artists more fan-exposure. 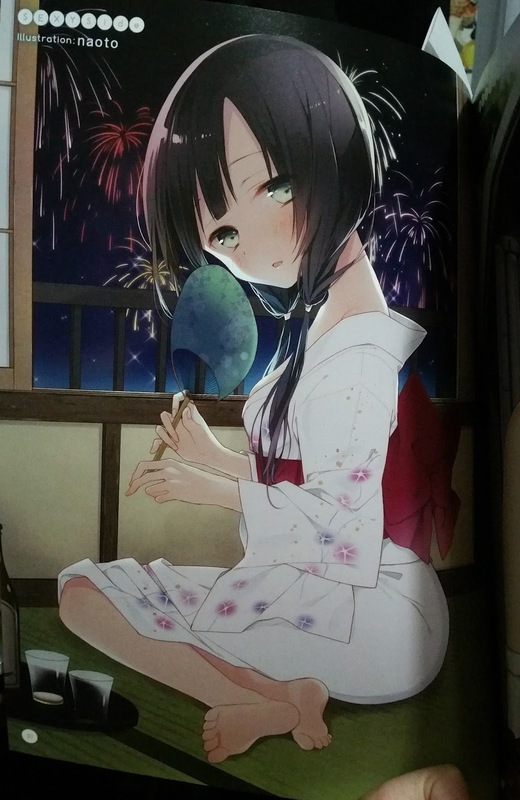 I love the colors in this art piece, especially the vibrant fireworks visible through the window. The only gripe about this illustration is that the body is extremely disproportionate, where Ema's head seems to be too huge for her body. And last but not the least, we have a comment page by all the different artists who contributed to this book and made it a reality. 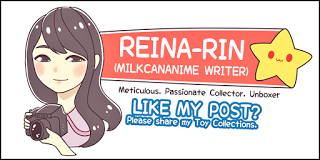 Most of them have their names (and links) listed, so if you end up liking one of the illustrations, do make sure to check the artists' profile out and show your support! 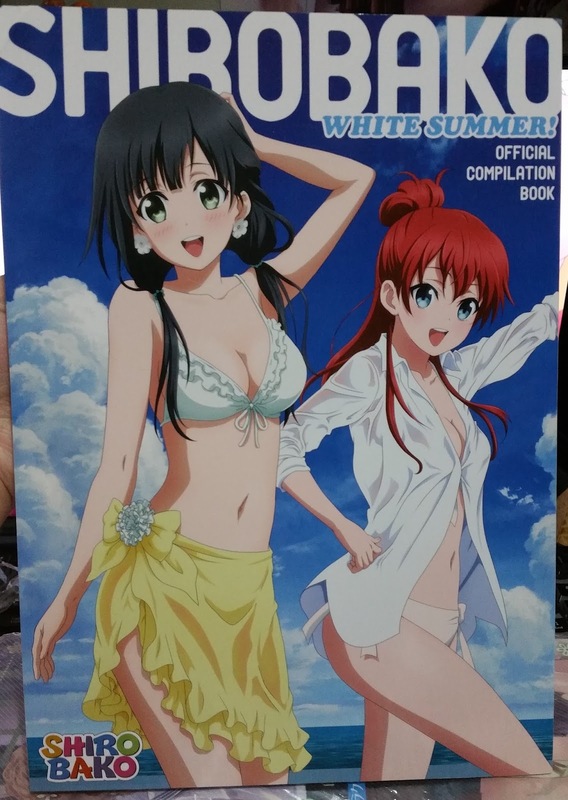 No Comment to " 「Book Review」Shirobako White Summer! Official Compilation "